Loft Boarding NW not only professionally board lofts for storage they also look at the energy efficiency of your loft, and advise on how it can be made more efficient to help save you money on your heating bills. Everyone knows from science class at school that heat rises, and in an uninsulated home, a quarter of heat is lost through the roof. If you could visualise this in £10 and £20 notes floating up through your roof you would call us first thing in the morning to get some insulation put in. Insulating your loft is a simple and effective way to reduce heat loss and reduce your heating bills for very little expense. When creating a storage space in the loft some companies drastically reduce your energy efficiency by remove or squashing your existing insulation. Loft Boarding NW would never do this; we always build above the insulation leaving a breathing space underneath the boarding to help keep the insulation as efficient as possible. Damaged insulation, or contaminated insulation which is mainly caused by debris falling when re-roofing is done, will ruin the insulation and its efficiency. The rubble and dust can turn to soil consistency, which absorbs moisture and creates condensation, and then damp will appear. The solution to this is to have your loft completely cleaned out. Removing the contaminated insulation and hoovering up all the dirt and rubble to leave a clean loft space ready to reinsulate to the government recommend minimum level of 270mm or more. 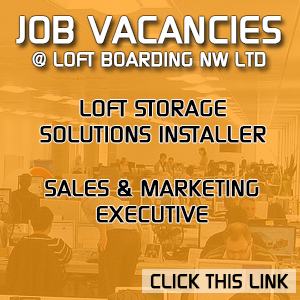 Loft Boarding NW provide all these services so you can get one company to do everything to save the headache of finding people to do all these jobs separately. Having your loft cleaned out and reinsulated will greatly increase your lofts energy efficiency. Loft insulation is effective for at least 42 years, and it should pay for itself many times over. If your loft is easy to access and has no damp or condensation problems, it should be easy to insulate and be quite inexpensive to have done. The average loft costing only £350 for up to 300mm of insulation based on a 30% discount we can give when you book other work with us like loft cleaning and boarding. If access is easy and your loft joists are regular, you can have rolls of mineral wool insulation. The first layer is laid between the joists – the horizontal beams that make up the floor of the loft – then another layer is laid at right angles to cover the joists and make the insulation up to the required depth of 270mm or more. If you plan to use the loft or attic for storage you don’t lay boards on the joists directly. Unfortunately, if you only insulate between the joists before doing this, the insulation won't be thick enough anyway so thus reducing your efficiency immediately. Insulate between the existing ceiling joists with mineral wool and then install a raised and supported sub-frame on to your internal walls and attach to roof purlings for support, to allow the next layer of insulation to fit in between the new floor joists. Then add the loft boarding on top of this. Make sure you never squash the mineral wool when you fit the boards on top, as this this will reduce its insulation value considerably and again reducing your loft energy efficiency. According to the energy saving trust this chart shows how much you can save by correctly insulating your loft. Examples based on a clean rubble free loft. Estimates based on insulating a gas-heated home with either a totally uninsulated loft, or topping up existing insulation from 120mm to 270mm. (The recommended depth for mineral wool insulation is 270mm but other materials need different depths). *Average unsubsidised professional installation costs, although these will vary. What other ways can help my loft be more energy efficient? 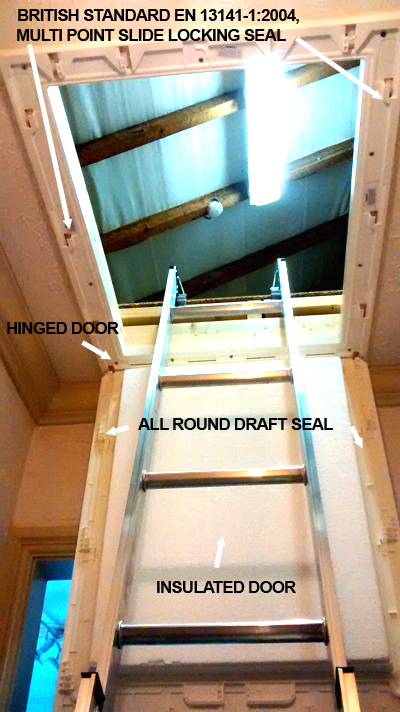 Replacing an old loft hatch must be done correctly, no point modifying an old push up hatch by reversing it putting hinges on and a catch without adequate draft seals, insulation and locking points. In some cases, it can't be helped as you may want to preserve the look of the ceiling by keeping to traditional wood, or finish to match the rest of the house. Although when done correctly it will be a little more expensive than a new purpose built loft hatch but not as energy efficient. In most cases it is not necessary to do this and it's far more cost effective and makes more sense to install a brand new purpose built draft sealed British Standards and Building Regulations approved hinged door hatch and frame. Most of us at some point or another have had our insulation updated to the government recommended level of 270mm. This will make a vast difference to your energy bills over the coming years. In some cases, you can get government grants to have this installed for free, they are quite rare these days but even if you are not eligible for free insulation it doesn't cost a fortune to buy your own, or have installed professionally. Old loft hatches have gaps and they don't seal shut properly, whistle to you on windy days and are pretty much useless to climb through to enable you to fit a ladder or use your loft for storage. It's important to consider having the brand new latest specification draft proof loft hatch installed if you're considering using your loft for storage, it may need to be done just to get a ladder in. In fact, even if you're not using your loft for storage changing your hatch will increase your lofts energy efficiency anyway. Handmade or reversing the door to convert an old hatch is not recommended as this will not reach building regulation specifications and not at all reliable at draft excluding or being energy efficient, doing this will decrease your lofts energy efficiency. Leaking loft hatches let through warm air which causes condensation build up. The best solution is to have installed a building regulations specification and British standard energy efficient loft hatch like this one (See picture). With the sliding cover replacing a conventional twist action locking mechanism on the door, all of the hinge, catch and fixing geometry has been carefully located outside of the draught seal, meaning that there are no holes through the door that could pose an air leakage risk. You can obtain a FREE Loft Energy Efficiency Report by arranging an appointment for a surveyor to come and price up for loft boarding packages. This FREE survey is only available when quoting for a loft storage package which include ladder light boarding minimum. Notes: The FREE loft energy survey is estimated from a visual inspection of your loft. The information is not exact and is only a guide to the energy efficiency of your loft to help you understand what can be done to increase the efficiency to maximise the saving on your energy bills. Most of our findings are based on the visual condition of your loft hatch and existing insulation. What we recommend is based on our expertise and knowledge to help you maximise your lofts energy efficiency. All recommendations are optional and can be quoted for separately if required.